The prospect of arranging a funeral can seem like a daunting task. There are many details to be arranged and your funeral director is the person you should turn to at this difficult time. The following guide will help you understand the different options that are available. However, you need to remember that each funeral should be as unique as the person being honored. Do not hesitate to ask your funeral director to help you with any requests that may not be presented in this guide. When a death occurs the first detail you need to take care of is deciding which funeral home to contact. In the past, people called a funeral home that had previously served their family. However, many families are now comparing funeral homes to find the one that best meets their needs. Trust is probably the single most important aspect in selecting a funeral home. You want a funeral home that is well established and respected in your community. At the most dificult time in your life, you need someone you can trust to help you through the confusion. Every family needs something different from the funeral ceremony. Some want very simple services while others want to express their grief more openly. Every individual is unique; every funeral ceremony should be too. Find a funeral home that can provide many options for the memorialization of the deceased. When a death occurs, emotion takes over and it is very easy to loose sight of the financial implications death causes. Often times you are suddenly faced with expenses you had not anticipated. You want to select a funeral home that can provide a dignified and respectful service while not exceeding your finances. The type of disposition will determine which services you will need and which ones you will not. Once you have decided on the type of disposition, the next decision to be made is what type of funeral service do you want to arrange. When it comes to service types you have many options. This is the most common type of funeral service and is probably what you are used to. It includes the funeral service in the funeral home or church with a period of time where the casket is open and friends and family may view the deceased. It also includes embalming; other necessary preparation of the remains; the automobile that initially brings the deceased to the funeral home; the hearse and a flower car. Many funeral homes also include limosines for the family and the pallbearers. The only difference between this service type and the "Traditional" is that the actual funeral ceremony takes place in the cemetery. This service type does not include any viewing of the deceased and the actual funeral ceremony is conducted in the cemetery. This service option may or may not require embalming. In this service option everything is the same as a "Traditional" service except that, after the funeral ceremony, the individual is cremated instead of buried. The "cremains" are either returned to the family or they can be buried in a cemetery or placed in a "niche" in a "columbarium". 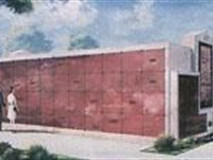 A columbarium is a mausoleum for urns. Here the deceased is cremated first and the memorial service is held later. When the body is not present at the funeral it is called a memorial service instead of a funeral. There is no public viewing of the deceased prior to the cremation. Embalming is not normally required for this type of service option. With this service option there are no funeral services or viewing. After the initial meeting with the next of kin, the deceased is taken directly to the cemetery or crematory. Embalming is not normally required for this type of service option. Your funeral director will contact you to schedule a time to come to the funeral home to make all of the arrangements. When he contacts you, he will ask you if you have given any thought to the type of services you want to arrange. Depending on your choice, the funeral director will ask for permission to embalm, if necessary. While it may seem like a very unpleasant question to be asked, the director is required, by law, to get your permission before the embalming can be performed. Having these decisions made in advance, allows the funeral director to begin the process of helping you arrange a meaningful and personal funeral service for the deceased. While everyone that comes to the funeral home at this time is encouraged to participate in making the arrangements, the funeral director is going to ask that one person be ultimately responsible for the final arrangements. This person is called the "informant". Normally this person would be the immediate next of kin. An itemized listing of all of the services the funeral home can provide for you. A list of every casket at the funeral home and the cost for each casket. A list of every outer burial container offered by the funeral home and the cost for each container. 1. The date, time and place of the funeral service. 2. The type and place of final disposition. 3. Will you have a public viewing? 4. If so, when and at what time? 5. Who will the minister or officiant be? 6. What songs will be played? 7. Who will the singers and musicians be? 8. Who will serve as pallbearers? 9. What special memorializations do you want in the service? 10. Do you want a family car? 11. Do you want a pallbearers car? 12. Do you want contributions made to a charity? 13. Selection of a casket. 14. Selection of an outer burial container. 15. What type of flowers do you want? 16. What flowers do you want to keep? 17. What flowers do you want taken to the cemetery? 18. Do you want the deceased to wear jewelry? 19. Do you want the jewelry returned to you? 20. As you can see, there is a great deal of work that goes into arranging a funeral. With the help of your funeral director, this process is much easier than you might think. As you can see, there is a great deal of work that goes into arranging a funeral. With the help of your funeral director, this process is much easier than you might think. These caskets have a one-piece rubber gasket between the lids and the base of the casket to help resist the entry of air and water. Your funeral director can show you how gasketed caskets are designed. Gasketed caskets are made from either bronze, copper, stainless steel or carbon steel. These caskets do not have the rubber gasket. This type of casket will include wood caskets and some carbon steel caskets. For some people it is very important that the casket is gasketed; for others it is not. This is something that you and your family need to decide together. If you decide that it is important that the casket is gasketed, then you will have to decide on what you want the casket made from. 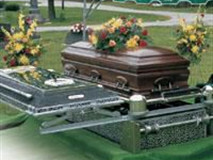 Gasketed caskets are primarily made from four different materials. These caskets are considered to be the "best" because bronze is a very hard, man-made material that will not rust. Bronze caskets will turn green instead. This is how bronze protects itself. These caskets are typically the most expensive. These caskets are also considered as the "best" because they too will not rust. They are, however, less expensive because copper is a natural element and it is not as hard as bronze. The Statue of Liberty is green because she is covered in copper. Copper caskets will behave the same way. Stainless steel caskets are considered to be "better" since they are rust-resistant. The Gateway Arch is made from stainless steel for this reason. Stainless steel caskets are going to be less expensive than copper and slightly more than carbon steel. Carbon steel caskets are considered to be "good" and are the most common caskets used. They are made from three thicknesses of steel, called "gauges". They are 20 gauge, 18 gauge and 16 gauge. The smaller the number, the thicker the steel. So, a 16 gauge casket is thicker than 20 gauge casket. All of the steel is chemically treated to inhibit corrosion but, like an automobile, they will eventually rust. The cost of these caskets will be determined by the gauge of the casket, the design of the casket and the type of material used in the interior. You have many choices when selecting a casket. Your funeral director can assist you in making a selection that will meet your needs and remain within your finances. If you have chosen earth burial as the form of disposition, you will need to select an Outer Burial Container. While it is not a law that you have one, most cemeteries are going to require one. The outer burial container has two primary functions. 2. 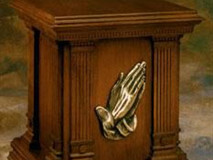 Protect the casket from grave elements. These containers are not designed to seal to protect the casket from grave elements. They simply satisfy the cemetery requirement for an outer container. This vault is coated in asphalt to make it water resistant. However, once the asphalt wears off, the vault will allow water to enter. The lined vaults have a plastic liner that is bonded to the inside of the vault. When the asphalt coating wears off, the liner will still keep water from entering the vault. The outer burial containers are much easier to understand when you can actually see them. Your funeral director will explain them to you completely. After the service has been planned, the casket and outer burial container have been selected, and all of the biographical information has been gathered, your funeral director will write the obituary and let you read it. This allows you to make changes in the obituary so that it is printed exactly the way you want it. The director will also give you a "Statement of Funeral Goods and Services Selected". This is an itemized statement of the charges associated with the funeral service you have arranged. It is at this point that the funeral director does the majority of his work. He will coordinate with everyone involved to make the funeral service you have arranged a memorable and meaningful tribute.